Granulation is one of the most important unit operations in the production of pharmaceutical oral dosage forms. However, there are many different technologies each having different strengths and weaknesses. Granulation is often required to improve the flow of powder mixtures and mechanical properties of tablets. Granules are usually obtained by adding liquids binder or solvent solutions. Larger quantities of granulating liquid produce a narrower particle size range and coarser and harder granules, i.e. the proportion of fine granulate particles decreases. The optimal quantity of liquid needed to get a given particle size should be known in order to keep a batch-to-batch variations to a minimum. Wet granulation is used to improve flow, compressibility, bio-availability, homogeneity, electrostatic properties, and stability of solid dosage forms. The particle size of granulate is determined by the quantity and feeding rate of granulating liquid. Wet granulation is used to improve flow, compressibility, bio-availability, and homogeneity of low dose blends, electrostatic properties of powders, and stability of dosage forms. Granulator process solutions involve smaller particles adhering to each other in order to grow larger particles or agglomerates. Particle size is critical in a granulator process solution because if the particles are too large or too small they do not have the product characteristics important to produce light powders into high density free-flowing granulates. There are many variables in controlling a granulator process, ranging from feed rate of the granulator liquid to the resonance time of the granulator chamber. All of these parameters affect the particle size in different ways. With an on-line sensor, the particle size is measured instantaneously and continuously in real time helping to monitor and control the granulator process. The fluid bed granulation process also known as agglomeration involves suspending particulates in an air stream and spraying a liquid from the top down onto the fluidized bed. Particles in the path of the spray get slightly wetted and become tacky. The tacky particles collide with other particles and adhere to them to form a granule. •	Dry Stage: In Dry stage granulation, the particles only require a slight wetting to become tacky and stick to each other. The granulating solution is applied at a rate less than or equal to the evaporation rate. Thus the particles remain "dry" through the entire process. •	Wet Stage: In Wet stage granulation, the particles require significant wetting before they become tacky enough to stick to each other. The granulating solution is applied at a rate higher than the evaporation rate until the particles build up enough moisture to granulate. The characteristics of the particles when wet and the type of granulating solution being used will determine which mode of granulating is most appropriate. While Dry stage is more common, Wet stage granulating allows for denser products. The system allows full integration with upstream and downstream equipment, and even includes a wet mill between the granulator and dryer. With modern control systems it is easy to load, mix and granulate a second batch in the high shear granulator whilst drying the previous batch in the fluid bed prior to discharge. All equipment can be CIP in a single automatic process. Where as a single shaker might be acceptable for drying application. 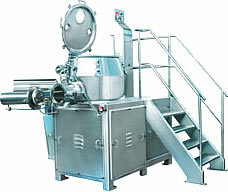 A twin shaker or blow back filter should be used for granulation processes.